If I’m going to be honest here, Malta was NEVER on my radar. I’d never even heard of the country until Game of Thrones came around (and my friend Nina posted all these amazing photos on the gram) and opened my eyes to its beautiful landscapes…and then I was obsessed! I HAD to go! Fortunately, Malta surprised me, in such a good way! WHY?! I had this misconception of it being super luxurious and shiny and it was anything but that…in the BEST WAY POSSIBLE! Malta took me by surprise with its landscapes and architecture. It literally is like Northern Africa and Europe had a baby and named it Malta. The sandstone meets classic European architecture is like nothing I’ve ever seen before. Needless to say, I was immediately hooked. 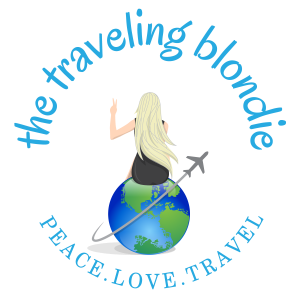 So, without further ado, here are some seriously awesome deets about this unforgettable country, so you can plan the best trip possible! Malta is a small independent nation (previously ruled by the British until 1964) located south of Sicily (Italy). It is comprised of three small islands: Malta, Gozo and Comino. Malta is the largest and Comino is the smallest (just 2.2 square miles/3.5km). The word Malta literally means ‘honey-sweet’ in Greek, which was given for its abundant production of the sweet nectar. 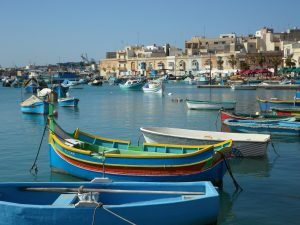 Fortunately, most of the locals you’ll encounter speak English (88% of the country is fluent in English), although they have two official languages: Maltese and English and a super bonus is that Malta is a part of the European Union (EU), so its currency is the Euro, which makes things super easy. Just prior to Malta we went to Positano, Italy for Josh’s birthday. Fortunately, we caught a SUPER CHEAP flight from Naples, Italy to Malta via RyanAir. The flight was just over an hour and was completely seamless (I’d definitely do it again). Direct flights leave frequently to Malta from Rome, Barcelona, and a few other major European cities. Upon landing, you can hop on one of the public buses to get into Valetta or Silema, as the bus system is super easy to navigate (and super cheap). Fortunately, the Maltese are super kind and easy to communicate with, just in case you need to ask a local for directions. You MUST read my advice here and DO NOT do as we did haha. We stayed in Valetta, and, while it is an absolutely gorgeous city, it is DEAD after 8pm. I mean like a TOTAL GHOST TOWN. So, in retrospect, I would’ve stayed in Silema, where all the fun, shopping and restaurants are. Fortunately there are Airbnb’s EVERYWHERE in Malta and, because Malta is a super safe country, you don’t need to worry about any dangers here. Our Airbnb in Valetta was horrible, so I wouldn’t recommend it (keep in mind that it was the 60th Airbnb we’ve ever stayed in and we’ve only had 2 poor experiences thus far), but I totally think that if you’re looking to save cash (and you’re not a hostel goer or couch surfer), then staying in an Airbnb is the way to go in Malta! 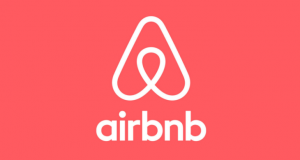 For $55 off your first AIRBNB booking, click HERE for my discount code! You have three options for getting around Malta, a scooter, a rental car and the public bus. 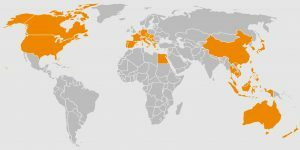 Unfortunately, Malta is too wide spread to walk everywhere and you’ll need a boat to get to a few places (as there are three separate islands that comprise the entire country). The public bus system is SUPER efficient and, if you plan to stay for a few days, the Valetta Card is the best bang for your buck (starting at 17 Euros). 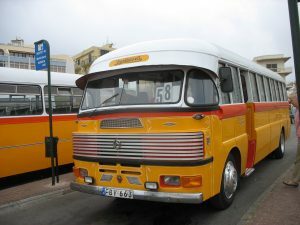 The Valletta Card allows you to travel by bus to Valletta from anywhere in Malta and back by bus to any location in Malta. The Card includes two trips on the ferry service which you can use to travel to Valletta from Sliema and from the Cospicua, and back. Finally, you can get around Valletta by bus on Route 133 – The Valletta Circular. The Card also includes free access to the Upper Barrakka lift when travelling by ferry from Cospicua. If you’re not interested in the Valletta card, each ride on any bus is 2 Euros per person. Be SURE to keep your bus ticket, as the ticket is valid for 2 hours on any bus, which is great because if you only spend an hour or so at a site, you can use the same ticket to get to your next destination. Total bonus: the buses offer free Wifi and are super easy to navigate! Check out their website for routes and timetables. You also have the option of the Hop-On-Hop-Off CitySightseeing Bus, which will take you all around Malta to its top sights (do note that it will not take you via boat to the Blue Lagoon, so you should absolutely take the HornBlower Cruise). As I mentioned before, Malta is SUPER widespread, meaning that you’ll need to take a bus or rent a car/scooter to get around. Thus, you’ll have to select which sights you want to see and allow ample time for each. Ideally, if you have 7 full days, you’ll have more than enough time to see everything! We had just 5 nights and we missed out on SO much! If you only do ONE thing I suggest in this entire blog, let this be it! 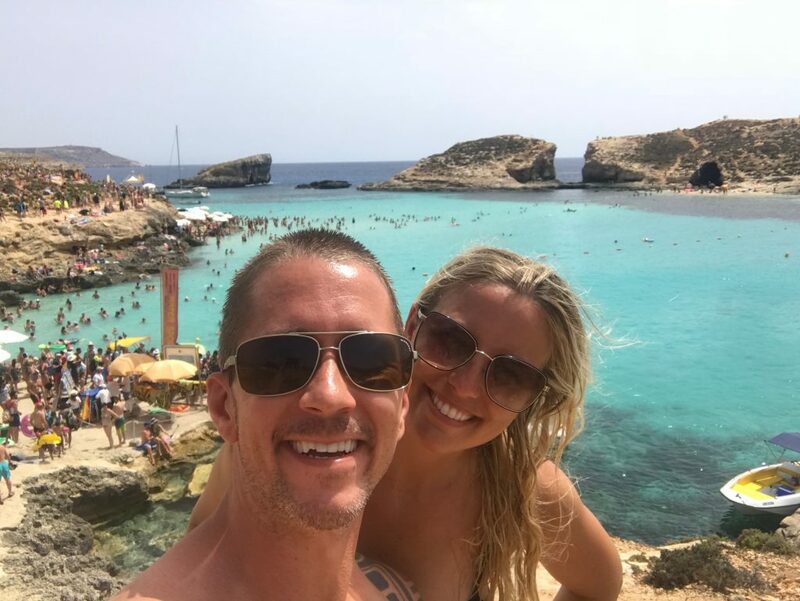 Our day excursion with Hornblower Cruises to the Blue Lagoon was the HIGHLIGHT of our trip to Malta! Tickets are 25 Euros per person, but note that it doesn’t include food, beverages or additional excursions. Hornblower Cruises will come collect you from wherever you’re staying on the island (for 5 Euros each way) and bring you to the departure terminal at Bugibba Jetty, where you’ll depart at 10:30am. You’ll cruise around the northern coast of Malta checking out the Statue of St. Paul, Ahrax Point, and even entering Ahrax Cave. You’ll cruise past Comino where you’ll see the elephants head, Santa Maria cave, Santa Maria bay, St. Nicholas Bay and the Comino Hotel. After an hour of cruising, you’ll arrive on Comino island in the famous Blue Lagoon. The boat moors up to the island where you stop for 1.5 hours. During the time in the Blue Lagoon you can use all the facilities of the boat and also have the freedom to walk on and off to the island. DO NOTE: you have the option to stay on the boat and not go to Gozo. We elected to do this option (and forgo Gozo), as we were having SO much fun sliding off the boat on the water slide, swimming in the blue ocean and enjoying the chill time. The boat is equipped with everything you need: a top sunbathing deck with free deck chairs, a main deck including shaded and sunny seats, lower air conditioned deck, toilet facilities, snorkeling equipment, locker facilities, and a cafeteria which has hot and cold beverages (although not a lot of options for vegetarians…I ate French fries). If you elect to go to Gozo, you’ll have three hours to explore Mgarr Harbour and the surroundings or get on a local bus to Victoria (the capital city of Gozo). 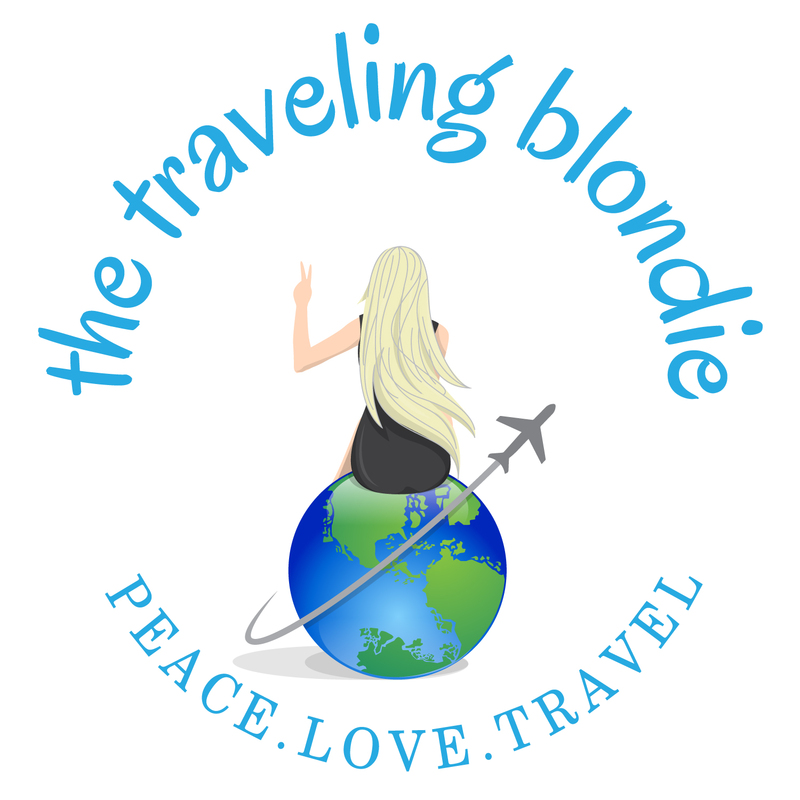 For the price of 5 Euros, you can book their bus transfer that will take you to Victoria (the capital city) where you will see the UNESCO site of Citadella, Ta’ Pinu Church and the famous Azure Window-from the scene in the show Game of Thrones where Daenerys Targaryen marries Khal Drogo. Sadly, this window collapsed in March of 2017. Note that the mini bus is booked and paid for on the same day after your arrival on the boat. 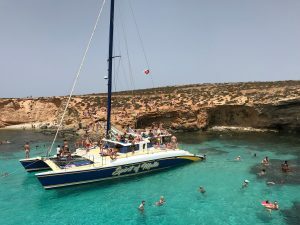 After your time in Gozo (or in the Blue Lagoon if you decide to stay like us), you’ll cruise back to Malta through the south channel of Comino, cruising by Crystal Lagoon and entering into the caves, and passing by St. Mary’s tower. You’ll arrive back to the departure point around 5-5:30pm. I PROMISE it will be an unforgettable day for you in Malta and you CANNOT MISS THIS EXCURSION! Plus, Hornblower Cruises is a family-run company and one of the owners came around to thank EACH AND EVERY guest on the boat at the end of the tour. There’s nothing like supporting local businesses and families! Our second favorite sight in all of Malta was Mdina, also known as the ‘Silent City’ and the city which once served as the capital of Malta during the medieval period. Josh and I are TOTAL SUCKERS for medieval cities enclosed by ancient city walls. I don’t know what it is that absolutely fascinates me about them…maybe its because I enjoy imagining what it was like to LIVE within these city walls that date back to nearly 4,000 years ago (yep, you read that right, 4,000 YEARS!). I got the same feeling in Dubrovnik, Croatia. It’s pretty difficult to describe just how beautiful these well-preserved city walls are in Mdina…you just have to FEEL THEM. I know that sounds weird, but if you’re a fellow traveler (and since you’re reading this, I’m willing to bet you are), you know what I mean about FEEL. 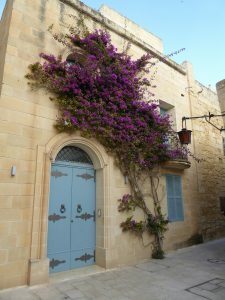 There is an almost eerie feeling that comes over to you as you walk through the narrow streets within the walls of Mdina. These walls are all sandstone in color and offset by the most gorgeous colorful flowers. It’s a photographers dream! You MUST go experience it for yourself! While you’re there, be sure to check out St. Paul’s Cathedral and the main Mdina Gate (duh)! Valetta is such a quaint, charming city with a photographable sight at every turn! There are SO many colorful shutters and doors set against brown sandstone. Throw in a few old English phone booths, and it literally makes for a photographers playground! My best advice for Valetta is to just get lost in the windy, hilly streets and take a stroll around the entire perimeter of old town Valetta, following the waters edge, to see it’s Grand Harbour. In the midst of getting lost, be sure to make your way to the Upper Barrakka Gardens, which are absolutely gorgeous and offer up beautiful views (and photos) of the water. It’s important to stop by Saint John’s Co-Cathedral, Grandmaster’s Palace, the Casa Rocca Piccola, Manoel Theater (one of the oldest theaters in Europe), the National Museum of Archeology, the Collegiate Parish Church of St Paul’s Shipwreck, the National War Museum and the National Museum of Fine Arts. Now you understand why you need SO much time in Malta, it will take you 1-2 days just for the city of Valetta! If you’re hungry while you’re in Valetta, be SURE to stop and eat at Falafel Street! For 5 Euros, you can get a falafel or chicken schwarma from a few friendly locals. We loved this place so much, I think we ate here 4 times in the 5 days we were there! The Blue Grotto (located on the island of Malta) is NOT to be confused with the Blue Lagoon (located in Comino). They’re two TOTALLY different sights to see, in two completely different locations. From Valetta, you can grab bus 74 and arrive at the Grotto Bus Station in about 30 minutes. When you arrive, you can purchase your Blue Grotto Boat Ride tickets there (no need to pre-purchase). 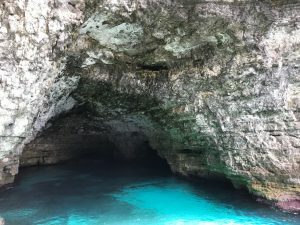 The small boat ride lasts about 20 minutes and takes you through the beautiful blue caves and waters along the southwest coast of Malta Island. It’s SUPER pretty, but I must admit, it doesn’t even compare to the Blue Lagoon. Nonetheless, it’s a must see so you can judge for yourself! Tip: You can squeeze Mdina in after the Blue Grotto, as they’re only about a 20 minute bus ride from other. You can also stop at the Dingli Cliffs on the way to Mdina (take note the bus only passes by Dingli Cliffs every hour, so you’ll need to hang at the cliffs for at least that amount of time before making your way to Mdina). If you’re planning a trip to Malta, you MUST put Silema on your list, as its the HAPPENING spot in the entire country! This is THE place for nightlife, restaurants, shopping…basically all tings fun! 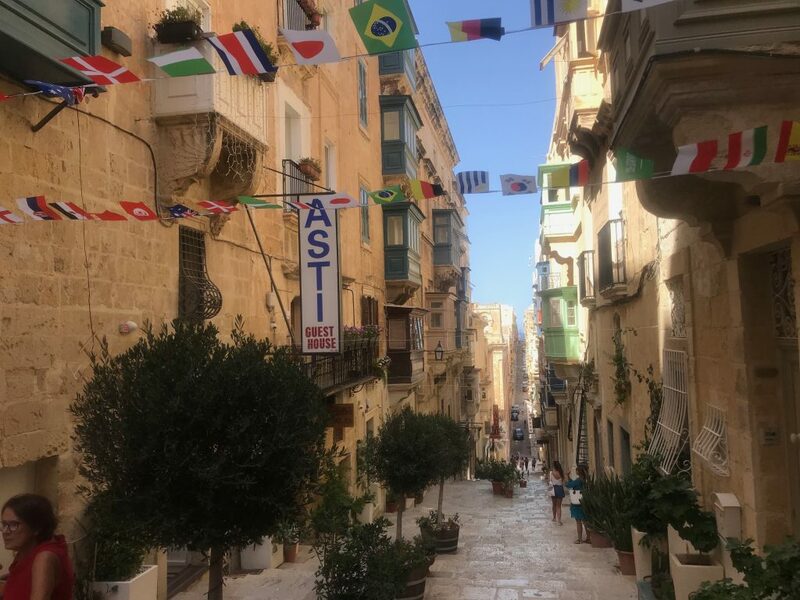 I totally regret not staying in Silema (we stayed in Valetta which was a total snooze fest after 8pm), so you need to go and stay there for me! Be sure to check out the Christine X Art Gallery, get lost roaming the streets and if you need to get your shop-on The Point has everything you’ll need and more! Once you get to Malta, you’ll quickly realize that you don’t have enough time to see everything that this incredible island nation has to offer! Everything is SO widespread and SO beautiful that it takes time to get to each place and explore it, leaving limited time to see it all! So, why am I saying this? 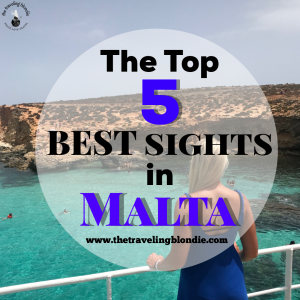 Because you’re going to have to CHOOSE and our choices LEFT OUT the 3 cities: Vittoriosa, Senglea & Cospicua (I’m feeling totally FOMO as I write this)! 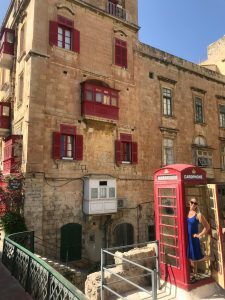 These cities give SO much history about Malta and, as I’m told, are absolutely stunning! So you MUST go for me and send me photos! Calling all DIVERS!!! 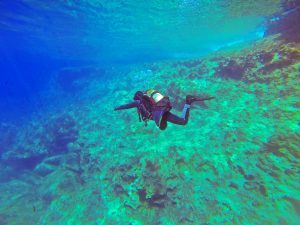 Malta is said to have some of the best diving in Europe and, while we greatly enjoyed our diving here and I highly recommend it if you’re going, we thought it was just ‘good’ overall. Although the waters are super clear, we didn’t really see much in regards to fish or reefs. Maybe its because we don’t have our advanced open water certification (AOW) and couldn’t dive deep enough? Our sample size was small, as we only dived one day in one spot, so I highly suggest you go diving there and see for yourself! 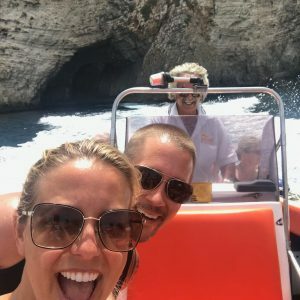 I HIGHLY recommend our dive company, Divewise Malta, as they were SUPER thorough and safe (which is obviously very important when it comes to diving). Our instructor, I forget his name but he was from South Africa, was AMAZING and incredibly patient with Josh and I, as we are fairly new to diving. Sadly, our GoPro Camera that we only use for diving saw its last day while Malta, so we didn’t get a lot of diving footage! RIP GoPro Hero 4! 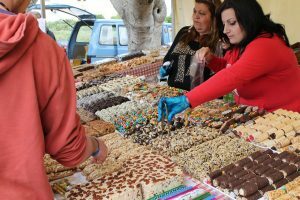 While you can get almost any type of cuisine in Malta, you cannot go to this great country without trying some of their well-known local dishes. Lampuki Pie (fish pie), Rabbit Stew, Bigilla (pate with beans and garlic), Bragioli (beef olives) and Kapunata (the Maltese ratatouille). Stop in any of the local bakeries and shops and just try something out, you won’t be disappointed! Such a beautiful detailed write up! Thank you for capturing all the details in your article.